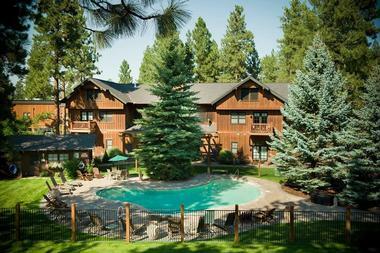 One of Oregon’s most romantic getaways, the FivePine Lodge & Conference Center is a luxurious hotel and conference center in the heart of Central Oregon that offers deluxe accommodations, upscale facilities and amenities, including a full service spa and conference center and world-class service. 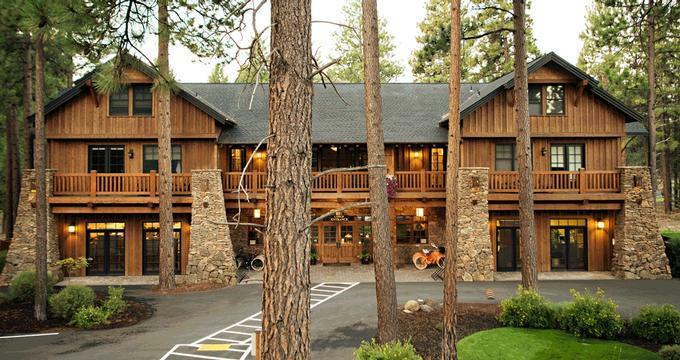 Situated just a few miles from Bend and Redmond in Oregon, this exclusive hotel promises an unforgettable getaway for both business and leisure travelers. 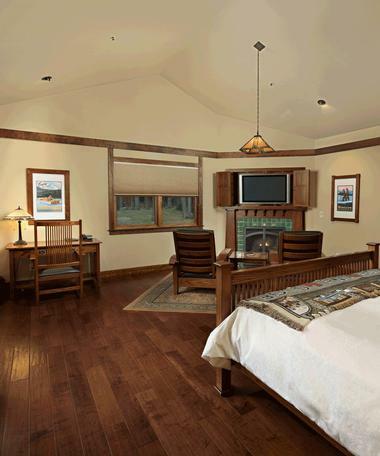 FivePine Lodge features a variety of accommodations for every taste, from spacious suites in the main lodge to romantic stand-alone cabins in the woods. Modeled after an old forestry station, the hotel’s grand main lodge is an elegant blend of rustic charm and modern convenience and features eight spacious suites, a relaxing communal lounge with a magnificent 30-foot rock fireplace and balconies and terraces with beautiful views. Dotted about the surrounding forest, 24 craftsman-style log cabins offer private and romantic escapes for those wanting seclusion and tranquility. FivePine Lodge & Conference Center is conveniently located on the FivePine campus near several local attractions, including the Sisters Athletic Club and Movie House, Three Creeks Brewing and the Shibui Spa. The hotel is also within close proximity of a variety of outdoor activities to enjoy, such as hiking the Peterson Ridge Trail, mountain biking, and exploring the Three Sisters Mountains. FivePine Lodge features a variety of accommodations for every taste, from spacious suites in the main lodge to romantic stand-alone cabins in the woods. The hotel’s grand main lodge features eight spacious suites that feature king-size beds with Simmons deluxe pillow-top mattresses and luxurious linens, as well as queen-size sleeper sofas for extra guests. Private en-suite bathrooms have walk-in showers and waterfall soaking tubs, thick towels, and branded toiletries, and large living and dining areas feature modern amenities such as plasma televisions with DVD players, coffeemakers with complimentary coffee and tea, mini fridges, gas fireplaces, and comfortable seating. Outdoor decks have Adirondack chairs to enjoy the beautiful forest views. 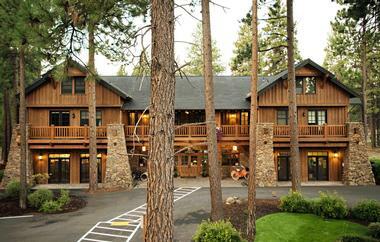 The hotel also offers 24 craftsman-style log cabins for those wanting seclusion and tranquility. Classic cabins are perfect for two guests and feature king-size beds with Simmons deluxe pillow-top mattresses and luxurious linens, as well as queen-size sleeper sofas for extra guests. Private en-suite bathrooms have walk-in showers and waterfall soaking tubs, thick towels, and branded toiletries, and large living and dining areas feature modern amenities such as plasma televisions with DVD players, coffeemakers with complimentary coffee and tea, mini fridges, gas fireplaces, and comfortable seating. Outdoor decks have Adirondack chairs to enjoy the beautiful forest views. Other cabins include the Romance Cabin, which has a king-size bed and en-suite bathroom with a beautiful sunken tile-and-rock soaking bathtub for couples, and the Caboose Cabin, which is perfect for families with a king and queen-size bed and ample living areas. There are three dining establishments on the FivePine campus from which to choose, including the Three Creeks Brewing Co., Rio, and the Sisters Movie House Café. The Three Creeks Brewing Co. serves a range of handcrafted ales and beers, along with a traditional pub menu of light meals and snacks; Rio serves authentic Mexican food and drinks in a convivial atmosphere; and Sisters Movie House Café serves American cuisine such as pizza, hot dogs, wraps, and salads. FivePine Lodge & Conference Center offers an array of amenities for guests to enjoy, including complimentary coffee and tea service during the day and drinks in the evenings, free access to the Sisters Athletic Club and free use of cruiser bikes to explore the area. The hotel also has an outdoor swimming pool, which is open seasonally, a variety of outdoor lawn games and complimentary wireless Internet throughout the property. Three Creeks Brewing is a traditional brew house located on the FivePine campus and produces a range of local ales and beers, as well as offers a pub menu of delicious fare. 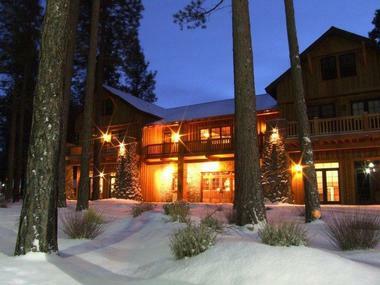 The Three Sisters Movie House is a four-screen theater situated just a short walk from the main lodge and cabins and features a diverse selection of films, documentaries, and other productions. The Three Sisters Movie House Café serves a delicious menu of bistro-style food and both alcoholic and non-alcoholic beverages. The Sisters Athletic Club is a 19,000 square foot fitness club that boasts the latest in exercise equipment and cardio machines, as well as free weights and treadmills, and offers a full range of group classes and swimming. 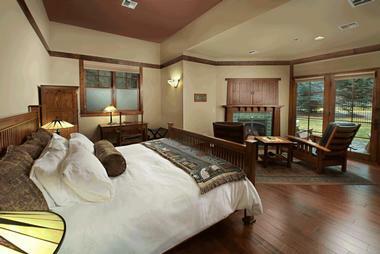 Access is complimentary for FivePine guests. The Shibui Spa offers pampering treatments in a world-class spa environment, creating a tranquil oasis inspired by the surrounding mountain and forest landscapes. The Spa presents an array of therapeutic and rejuvenating treatments including massages, body treatments and wraps, facials, manicures, pedicures, waxing, and other holistic services. FivePine Lodge & Conference Center offers beautiful venues for weddings and other special occasions, as well as an array of event services, such as catering and cuisine, wedding planning and event management. The hotel is also home to a modern conference facility, which is ideal for meetings, business gatherings, and conferences.